The Green Bay Packers finished the 2008 season next to last in penalties and last in yards lost by penalty. Barring a drastic change in habits, the Packers could be even worse this year. Through the first five games of the season, the Packers are on pace to commit more penalties for more yards than they did in 2008 when they committed 110 penalties for 984 yards. So far this year, the Packers have been flagged for infractions 43 times for 359 yards. They’re on pace to commit just under 140 (138) penalties for more than 11-hundred yards. Both would be franchise records. Sunday, the Packers were flagged 13 times for 130 yards. 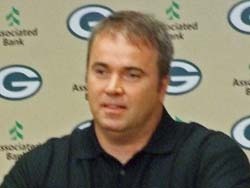 McCarthy hasn’t made any in-game substitutions based on penalties yet this season, but he admitted in his Monday press conference that the thought has crossed his mind. Pre-snap penalties are the worst. Those are mainly a result of a lack of concentration. Yet veteran left tackle Chad Clifton was flagged four different times, twice each for false starts and illegal formations. Trying to solve the problem is difficult. Short of benching a player, the only thing that can be done is constantly preaching to the team about the problem, stressing fundamentals in practice and simulating game conditions to put players in positions they may see in a game. The problems may reflect poorly on the coaches, but make no mistake, they reflect even more poorly on the players, who continue to make the same mistakes week in and week out.